The GGSCF is run by children/youth/parents who help out and volunteer their time for the organization. For this to happen, anyone can submit a “proposal” to the Board of the GGSCF detailing the event that they would like to organize, keeping in mind the vision, mission and values of the organization. A “proposal” to hold an event can be submitted to the GGSCF Board by using one of the two templates given below. The templates have been formatted to allow the organizer to think about the planning of the event, the purpose, logistics, finances, volunteers etc. This also allows the Board to evaluate the proposal and ensure that the event being organized is in keeping with the goals of the GGSCF. If you need help preparing a proposal then get help from your parents, older brother/sister, or you can ask the older youth in the GGSCF, and if all else fails, you are always welcome to email us at mail@ggscf.com for help as well. Use this template for simple events such as a one day event, local branch events, events with a turnout of less than 100 people, etc. Examples: Skating trip, bowling trips, toy drive, etc. Use this template if the event is major, i.e. over several days, involves or is open to all branches, turnout of over 100 people, major sponsors are involved, combined event with another organization etc. Examples: Annual Relay Run, Conferences, Anniversary Dinners, etc. Note: Events that happen annually do not require a new proposal each year. The Board however needs to be aware of the event dates and the main organizers. Examples: Guru Nanak Food Drive, Toronto Waterfront Marathon, Fun Day, Hungry Moose Parade, Senior’s Trip etc. When you have completed the proposal template submit to board@ggscf.com. The turn around time required by the Board is 10 days for basic proposals and 30 days for major event proposals. Please do not submit proposals in less than this time frame and expect urgent response. Submitting the proposal does not mean it is approved. The Board may want to discuss the proposal with you in more detail before making a decision. The response from the Board will be by telephone, email and/or face to face contact. Organizing events is hard work and requires you to develop and exhibit leadership. 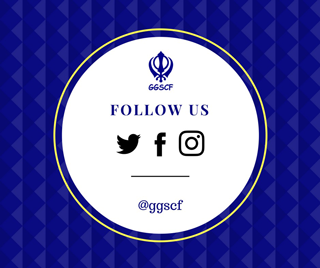 The GGSCF allows this so that individuals can gather leadership experience by starting with small events and building up into major events. While strong leaders are required for the future, the type of leaders the GGSCF seeks are those that like to work in teams and are good mentors or role models for children and youth. If you are considering organizing an event we commend you for the initiative and for following the above process.